I finally finished my daughter’s green room. As you might remember, her room started off with lavender walls, pink/green/yellow/purple bedding, and a white Pottery Barn rug with flowers on it, all of which M deemed “horrible” (reminder: she’s almost 5). She wanted it “all green.” Have I mentioned green is her favorite color? 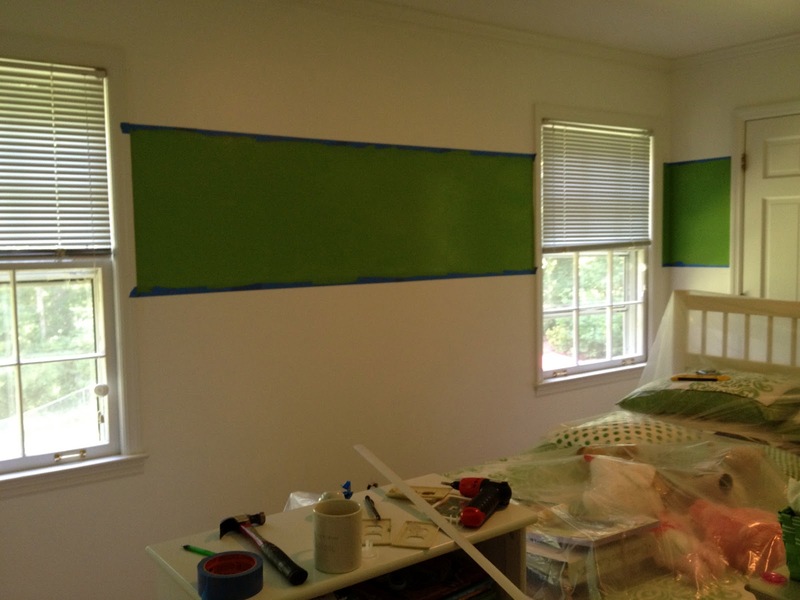 I refused to paint the walls the color green she wanted, which was something like Kermit the Frog green. I decided I had a better way. 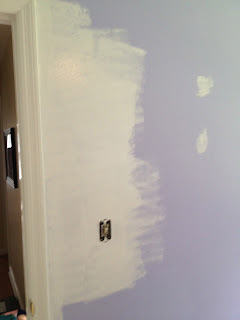 First, I started painting the lavender walls with white paint. Let me tell you – lavender is not easy to cover. Here’s the start of coat #1. It took THREE coats. 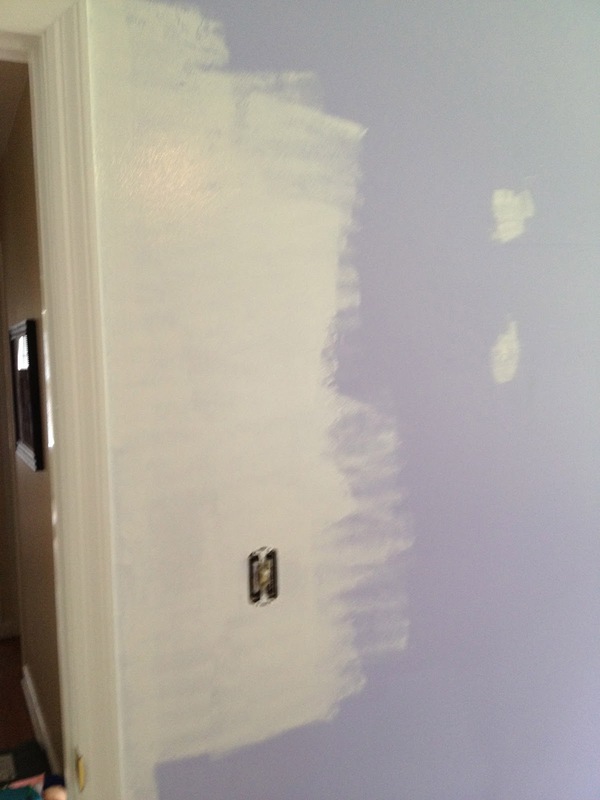 I even changed brand of paint on the second coat, thinking that had something to do with it. It didn’t. The purple was just hard to cover. Three coats. I used (mainly) Olympic no-VOC paint in ultra white. That’s Hank the Dog, wondering what I’m doing. After three coats of white paint, I then taped off the stripes. I have a laser level somewhere, but the home-improvement gremlins have hidden it, so I used a regular ol’ level for this. It took some adjusting, but eventually I got it level and right. 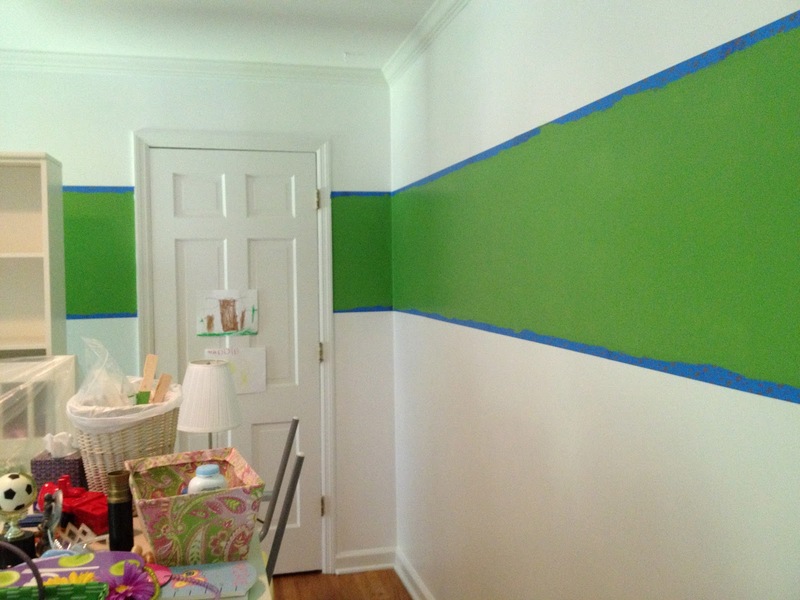 Then I painted the stripe green. The color is Grass Stain (Valspar Signature color). Anyway, after two coats of green paint, I pulled the tape off and touched up the paint. Then, while the paint dried, I did some other painting. I had bought a desk at Goodwill for $20 about 6 months ago. I had bought it for M, but I wasn’t sure where it was going to go in her room, so it had been hanging out in our breakfast room. Today, I sanded down the wooden face of the drawer and painted it the same green. I also painted the frame of a full-length mirror green. M told me that she didn’t just like her new room, she LOVED it. She also told me I was “the best mom in the whole entire universe and world.” I mean, you can’t beat that. Everything else, we already had. I’m really happy with how it turned out, and I’m thrilled that she loves it. That’s the main thing…she just loves it. I told her she can’t change her favorite color until she graduates from college. Click here to see how I ended up rearranging the room to make a larger play space for my daughter. Wow! Love the room. You are quite the DIYer! Thank you! M loves it, and that makes me so happy. She says that the stripe looks like it’s a present. Smile. You are the best mommy in the universe! Even the dogs think so! 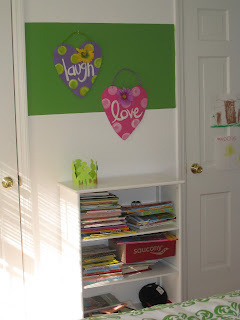 What a great idea to give the kids what they want – without having to paint the whole room (that they’ll want to change in a year or so anyway)! 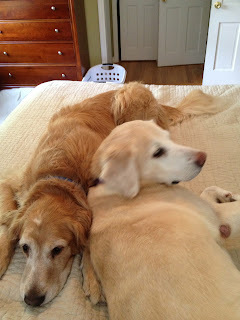 I let my girls choose – wow, did they choose some bright colors!! So glad you joined our Color party! Pinning this – giving me an idea for my girls playroom which my daughter wants in “hot pink”!! Thank you! I’m so glad it gave you an idea for your girls’ playroom. I could not imagine a whole room of that color green, so I thought this was a good compromise. 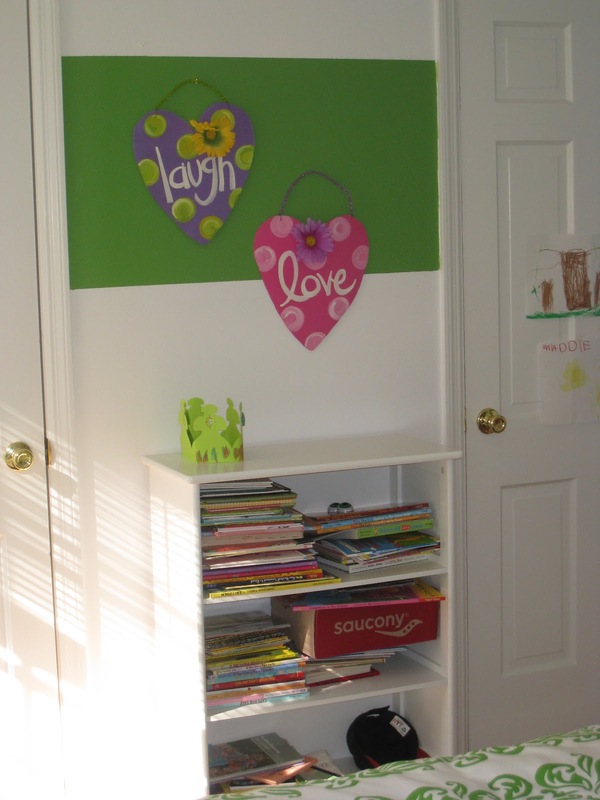 And I love how kids love such bright, happy colors – just have to control how much of them end up on the wall! I’d love to see the playroom when you paint it. Thank you again. Thank you, Karah! Thanks for hosting the party! I’m honored to be meeting the best mom in the whole wide universe and world! 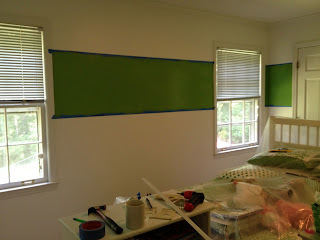 Love your green stripe solution … and now I’m scared because I painted my daughter’s room purple and she wants a change which means I’ll be painting three coats of cover the purple! Thanks, Linda! Thank you for hosting the party! And good luck with the purple…it’ll be fine, but it wasn’t fun to cover. I love that color!!!!! The room looks amazing. and I can’t believe that lavender took so many coats to cover. i would have thought it would be no big deal. Thanks, Jocie! Thank you for hosting the contest! I didn’t think the lavender would be hard to cover, either, but, wow, it was. Thankfully, I don’t think we’ll have any more lavender rooms in this house. Thank you, Rita! My daughter loves green; she is not a pink and purple kind of girl. She loves the room. I’m glad you liked it, too! Thanks again! Green is my favorite color, too…cute room! Thanks! My daughter LOVES green, so she just loves her room. I like the way you allowed the green but not too much. It’s just the right amount. Did you stencil the shades, or was that the print? 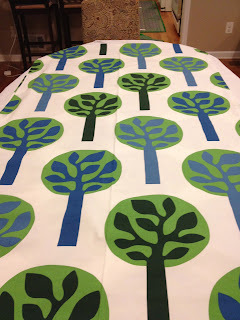 I just saw someone’s blog where they stenciled something very similar and stenciling curtains seems to be the rage these days. Something I have no patience for! Thanks! I did not stencil the shades (I am really not good at stenciling!). The fabric is from Ikea. I don’t remember the name of it, but can look it up if you are interested. Thanks again! hi, it is beautiful. It looks refreshing to the eyes. Terrific Job.